I visited with 2 of my favorite rubber stamp artists Saturday, Cindy Kicinski and Lesley Retherford. We had the best time stamping and eating sweets. We each brought one shoe box project. 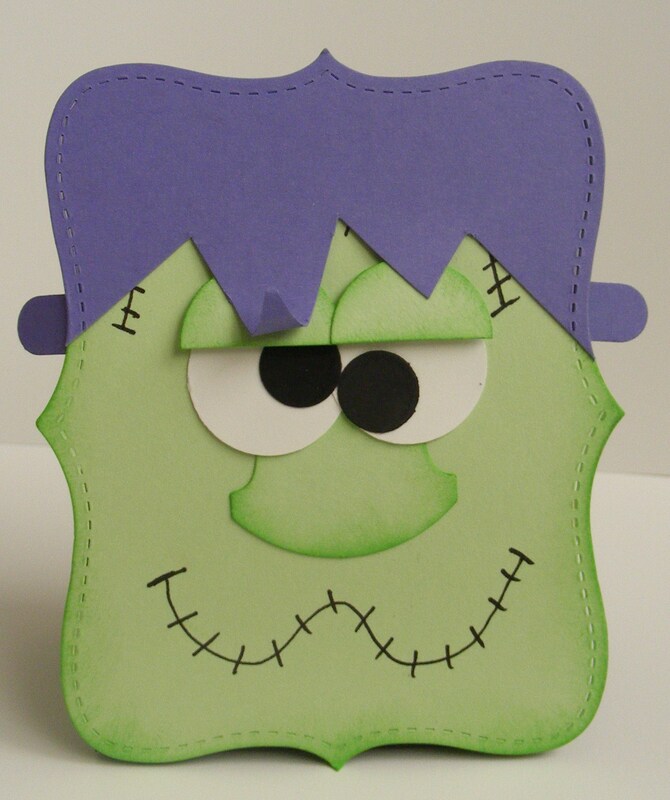 This cute little Frankestein’s Monster treat box was supplied by Cindy. I just love it. She said she was not the original designer. If anyone knows who it is please add a comment to this post. Whoever the original designer is deserves a huge round of applause. This monster is pieced together like the original Frankenstein’s Monster only this time it is from paper punches… that’s all… no stamping. The black pupils are half inch circles, the whites of his eyes are 1 inch circles, his nose is made using the round tab punch from Stampin’ Up! The purple knobs on the side of this head are punched with Stampin’ Up!’s word window punch. His face and hair are made with the Top Note Big Shot die. He was really easy to make. After you punch all the pieces out, sponge all green pieces with coordinating green ink, then assemble. They eyelids are attached with Pop Dots. The “hardest” part was freehand drawing the mouth and scars. Cindy recommended drawing the mouth first so if you messed it up you wouldn’t already have the whole piece assembled and you could easily start over. This is a back view of the box. 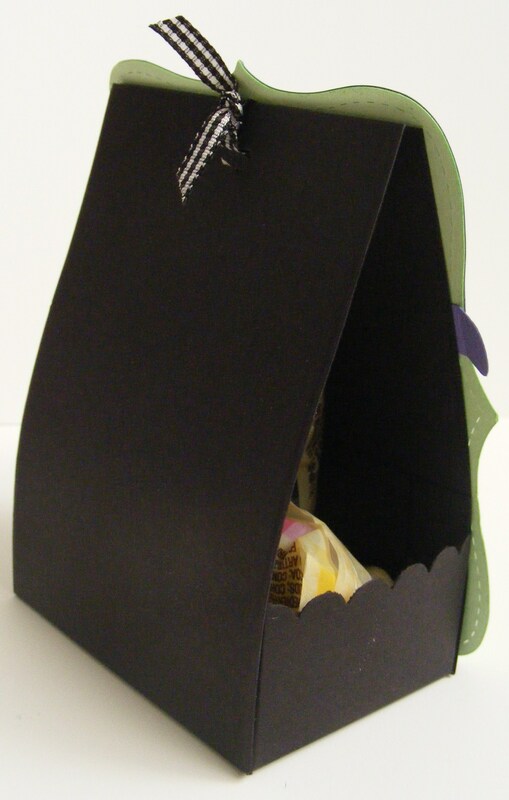 The monster is just adhered to the front and the inside filled with your favorite goodies. This entry was posted in Rubber Stamped Items, Treat Bags and Boxes and tagged Frankenstein's Monster, Halloween Treat Bag, rubber stamping, scrapbooking. Bookmark the permalink.